Blend the rapadura in the food processor until it is flour like. Run it through a sieve to get even thinner. Put it aside. Peel the mexiricas and squeeze with the hands to get all the juice out. It is important to take the peel off so that no residues of that kind of acidity are left. Keep cool. Clean the mushrooms with moist paper towel. Don’t wash. Cut then in very thin slices. The thinner the slices, the better the flavor. Grate the Grana Padano when serving in a very thin grater like microplane. Mix the rapadura flour with salt flowers. Place some of the consommé at the bottom of the plates. 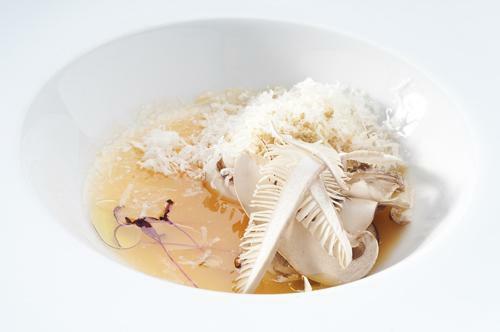 Arrange a small quantity of mushrooms so that not all of them are in touch with the consommé. Add some of the rapadura flour with salt flowers. Sprinkle olive oil and top it with the Grana Padano and the beet sprouts. Serve immediately.